Midwest Farmers Cooperative is a farmer owned cooperative operating 28 locations throughout southeast Nebraska. For nearly 100 years, we have provided value and services to help our patrons be successful. We are a full service cooperative with products and services offered in Grain, Agronomy, Energy and Feed. We have a lot of people with questions on the flooding and wanting to help. Here is what we received from Keith Glewen, the Extension Educator with the Eastern Nebraska Research & Extension Center. "While flood waters are receding the scars of this catastrophic event are evident across many areas of Nebraska. Extension faculty and staff are engaged in an "all Hands on deck" effort to address the recovery. My fellow Educators and Specialists now and in future days, weeks and months will be posting resources at the following website: https://flood.unl.edu/." This website has a lot of information; donations, volunteering, resources, etc. Please check out this website and share it with everyone, anyone who may have been effected by this event. Here is some information on how to help and what is needed. Go to this link for more information. The annual meeting of Midwest Farmers Cooperative was held January 22nd in Syracuse. Election results were announced. Ron Ehmen, Wade Nutzman, Mark Weber, and Dave Wehrbein were re-elected to the board. With this election, the board of directors went from 13 members to 12 members. Additionally, John Oehlerking was recognized as he is stepping down from the board of directors after 17 years of service. We thank John for all he has done for the Coop over the years. Midwest Farmers Cooperative offers many products and services in the areas of agronomy, energy, feed and grain. Check the individual department pages for products and services. If you have questions or comments, feel free to call us at 402-994-2585 in Elmwood or call any of the locations listed on the Location Map page. Our April (Spring) newsletter as well as some previous newsletters can be found on our Newsletter page. Click here to go to that page. 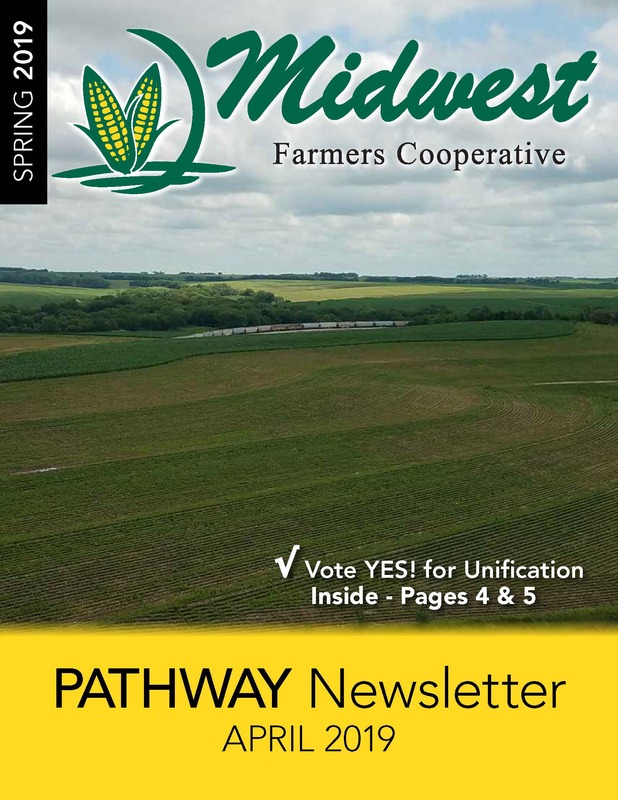 The Board of Directors of Midwest Farmers Cooperative and Frontier Cooperative voted to sign a definitive agreement. Below is is the letter being mailed to members. This letter has information on when and where the member meetings are going to be held as well as contact information for some board members. * Effective Feb. 4, Free DP is now being offered for corn & beans coming off farm, into Midwest Coop locations. Free until 8/31/19. Call us for details. You will need to have a contract in place before delivery. * The Midwest Farmers Cooperative 2019 scholarship was awarded to the below students. Click here for additional informaiton and prior award winners. * Midwest Farmers Cooperative teamed up with Land O'Lakes and CoBank to donate $6,000 to the Rural Back Pack program with the Food Bank of Lincoln. One in five children in Nebraska under the age of 18 is at risk for hunger. This program provides back packs filled with healthy food for children of need to take home on Friday afternoons. This year the donation by Midwest Farmers Cooperative will go to children in Adams, Bennet-Palmyra, Elmwood-Murdock, HTRS, Norris, Pawnee City, Raymond Central, Syracuse, Tecumseh and Waverly. Click here for presentation of check. * Midwest Farmers Cooperative is committed to supporting our communities through activities, education, grants and scholarships. For the 2018-2019 school year, MFC has awarded $23,000 in grants to local FFA chapters. Click here for more information. * Fertilizer contracts are now available for the 2019 crop year. Contact your local Midwest Farmers Coop location for more details.